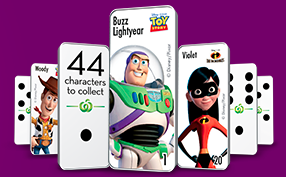 As a shopping premium, Woolworths in Australia is currently handing out collectible Disney Pixar dominoes. For every $20 spent in the store, shoppers get a single domino. The set includes 44 dominoes with different Pixar characters. There are also a variety of accessories, such as cases, tins, and stunt ramps, which can be purchased separately.